George Bischoff was born into a German family in Maryland in 1862 and did an apprenticeship in a carriage factory there before moving through several states and settling in Florida from around 1881-1890. In 1894 Bischoff had moved to Gainesville, TX with his wife and daughters and was operating a shop as a general blacksmith and carriage and wagon works. Eventually Bischoff transferred exclusively working and producing bits and spurs and had some form of partnership or arrangement with McChesney for a period of time. In 1911, Bischoff published his own catalog of bits and spurs and in 1915 sold his business to C.P. Shipley who was expanding his bit and spur production. Consequently, Bischoff moved to Kansas City to work for Shipley as the manager of the bit and spur department before eventually moving to Oklahoma, to work in many different fields such as oil, cars, farm equipment, and even in aircraft during WWII. G.A. 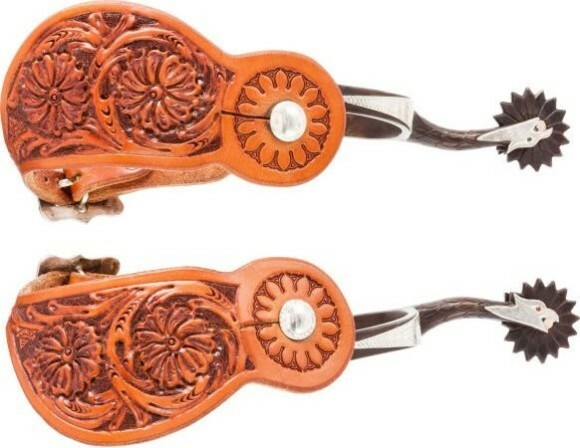 Bischoff is maybe most famous for his gal-leg spurs which were available in several styles and were widely copied by other makers. The fact that Bischoff only produced spurs and bits under his own name for a short period in addition to the high degree of craftsmanship and beauty has created intense collector demand for these items and values are quite high for good quality and interesting Bischoff pattern bits and spurs. Contact Us for help with an up to date value of any items you might have. Click here for information on Bischoff Maker’s Marks.